Av. Ponce De Leon S/N, 34005 Palencia, Spanje. 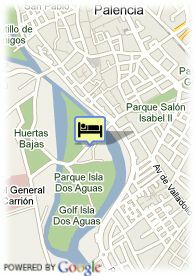 Hotel is located with Golf Court in the centre of Palencia. The Rey Sancho Hotel has an exceptional location in the centre of Palencia. At just 100 metres from the old town and surrounded by a municipal golf court, this hotel is the ideal place to stay and to visit the city and have a rest. Having newly reformed facilities, the Rey Sancho offers 93 exterior rooms with views toward the old town of the city. The hotel also offers 5 meeting rooms, with capacity for more than 500 people, ideal to hold congresses, reunions etc. The restaurant of the hotel offers to the clients a great menu with typical products of the region. During the summer time, the buffet breakfast is served outdoors by the pool. An authentic pleasure for the rests' and quietness' lovers. Betalende overdekte parking aan het hotel (8.56 €), Reservatie verplicht.